Steelers are a "hot mess"
Thread: Steelers are a "hot mess"
All I know is that we still have a damn great offense, with or without Le'veon Bell. In their W last night, Ben tossed 3 TD's, was an outstanding 30 of 38 and had a total of 353 yards passing. They couldn’t even land the team plane here without drama, having to abort to nearby St. Petersburg on Sunday because of thunderstorms. Some of the players plotted a cockpit takeover, joked linebacker Bud Dupree. “I thought we were kidnapped,” he said after the game. On Monday night, the game started with turbulence: a Steelers penalty. On the opening kickoff. Then the defense gave up a touchdown. And then came a stiff-arm that will go down in football folklore, with tight end Vance McDonald receiving a Ben Roethlisberger pass and then delivering a meme-tacular blow to Bucs safety Chris Conte. I just could not believe the Week 1 meltdown against the Browns. Clay Matthews was borderline wrong, in spite of how the rule is written. 'sackers' wrap a QB up rather than a smackdown. The penalties with the "Personal foul, roughing the passer" crap is out of hand!! There were about 30 penalties in last nights game - and both sides got nailed with unreasonable penalties where your typical tackle was now called a penalty. I can ONLY see the addition of "any" helmet to helmet contact, but far too much lameness. BOTH of Matthews tackles were perfect IMO! Funny thing about helmet to helmet is it should be a judgement call. player going to be called for it? Under this new interpretation, no. for example. Charley Taylor lowered his head into tacklers all of the time. Last edited by Elessar; 09-25-2018 at 04:24 PM. 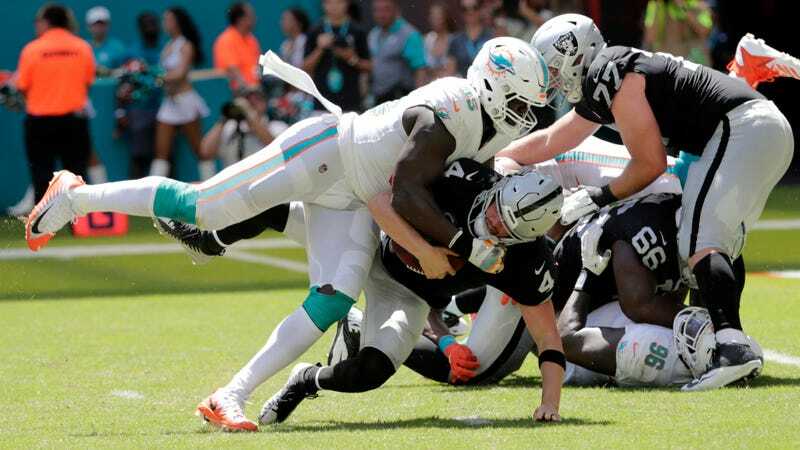 Dolphins defensive lineman William Hayes hurt himself while sacking Derek Carr yesterday, and today two worst-case scenarios were confirmed. Not only did Hayes tear his ACL on the play, he did so while trying to follow the NFL’s asinine new rule that prevents defenders from landing on the quarterback. I watched this yesterday, a highlight of Mean Joe Greene's career. He would be ejected in every game today!! That would be after racking up like 24 roughing the passer calls! Last edited by Elessar; 09-26-2018 at 09:29 AM.